Since the titian-haired girl detective from River Heights cracked her first mystery in The Secret of the Old Clock nearly 90 years ago, there have been dozens of iterations of Nancy Drew and her best friends, Bess and George, featured in books, TV, and films. Now, Dynamite Entertainment offers the latest rendition of the cracker-jack teen sleuth with a comic that fully realizes Nancy’s feminist tendencies, adds several characters who are people of color, and finally, unmistakably queers perpetual “tomboy” George. 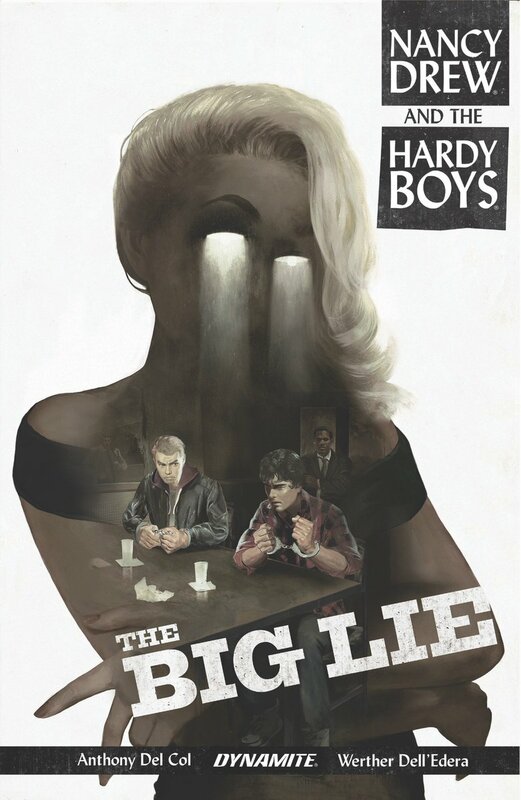 The first issue isn't out until mid-June, though—yes, OBVIOUSLY I have it pre-ordered—so I picked up Anthony Del Col's Nancy Drew & the Hardy Boys: The Big Lie to tide me over. In it, Fenton Hardy is MURDERED and Frank, Joe, and Nancy team up to solve the case! It's fine. I'd recommend borrowing it from the library over buying it, but I read all six issues this morning, so clearly it kept my interest. The thing is, it's less a Nancy Drew story—in terms of her personality and know-how, I mean—and more a modern noir story starring teenagers from various Stratemeyer Syndicate series. Kind of like Riverdale and Archie, but with far less Easter Eggs. Sadly, Bess doesn't appear and the one time George does, she looks more like Bess than George AND is trying to find something out about an ex-boyfriend, which, like. No. Even in the original books I never bought it about George having boyfriends. MID-JUNE CAN'T GET HERE SOON ENOUGH, OMG!!! !